doesn't get a whole lot of attention, but it was a vibrant commercial area for more than a century. 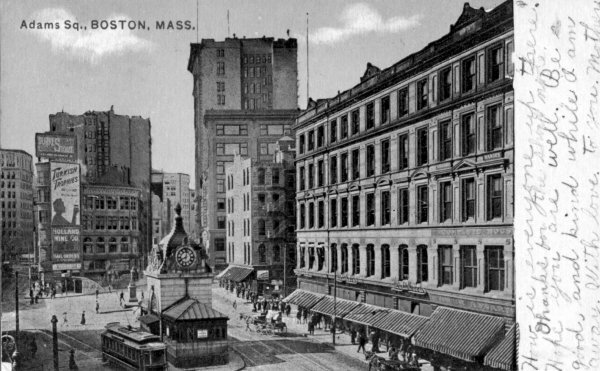 district some time after 1898, when the Adams Square subway station opened. 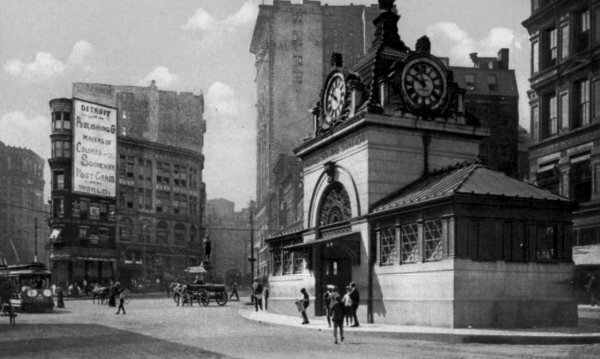 of the Adams Square subway station, a duplicate of the one opened at the same time in Scollay Square. 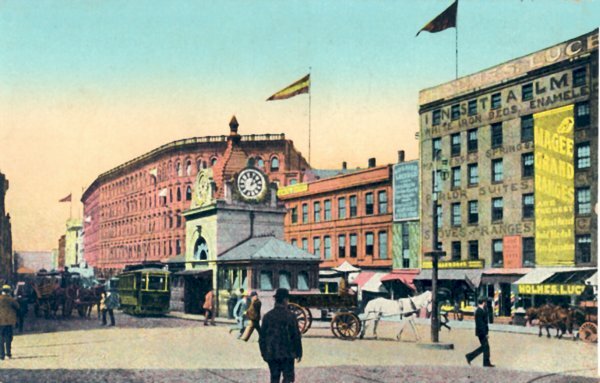 This postcard shows Adams Square from the other side of the subway station, looking north towards Haymarket. 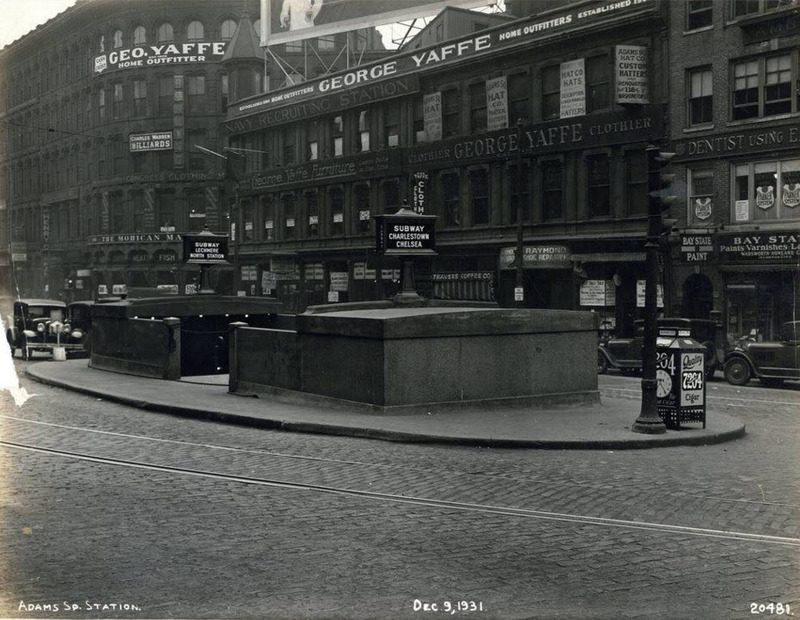 As seen in this Transit Department photo from 1931 (which was posted by a member of the Facebook "MTA Through the Years" Group) that beautiful Adams Square kiosk would suffer the same fate as its twin in Scollay Square; to be removed and replaced by this simple concrete entrance. Hanover Street. 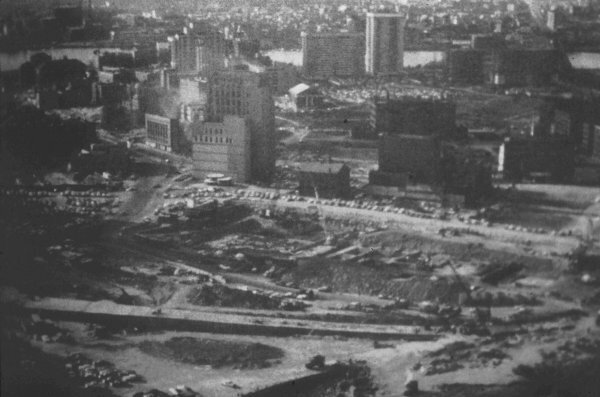 In the background we can see an off ramp to the then new elevated Central Artery. Standing in the same place as above (the corner of Washington and Elm Streets) John Munsey turned to his right towards Faneuil Hall. John's 1962 photo is almost the exact view used by famed photographer Leslie Jones in 1930. 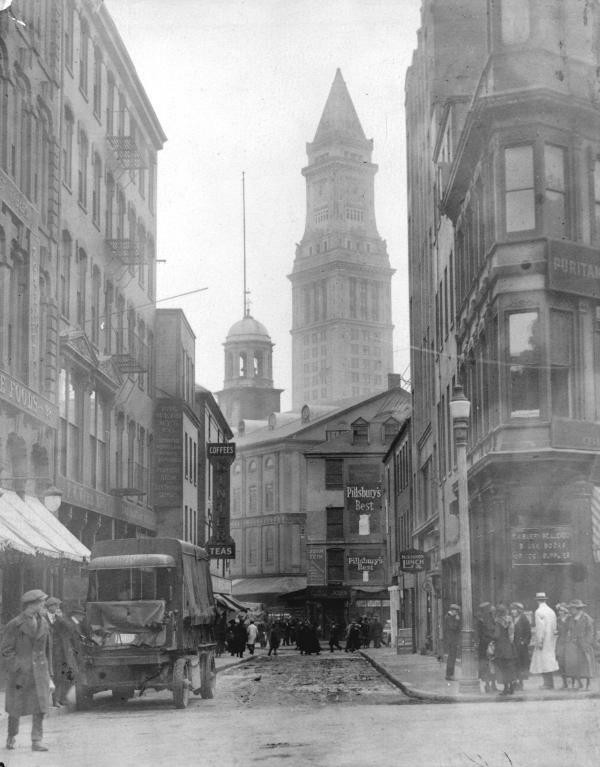 Moving away from Faneuil Hall back into Scollay Square, John Munsey photographed the view on our left of the Custom House Tower from Elm and Brattle Streets. A few years earlier, as we can see on our right, the B.R.A. went through Scollay Square to document the conditions of the area, in preparation for redevelopment and took a photo from the exact same spot. Back in Adams Square we are, in John's photo on our left, looking up Brattle Street and can see all the way into Pemberton Square and the "new" Courthouse. The Leopold and Morse building is on the right side of Brattle. 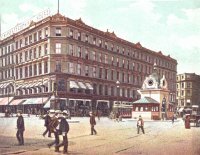 Leopold and Morse was one of Boston's biggest stores when it opened in the late 19th century here in Adams Square. The image on our right, from the early 1900s, shows the building in better times. Everything in this photo, save for the courthouse, would be torn down to make way for the new City Hall building. 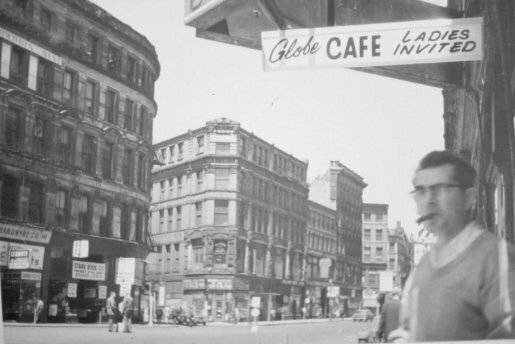 The other end of the Leopold and Morse building can be seen across the street from the venerable Globe Cafe. This photo, taken by the B.R.A. several years before John's photo above, shows us where Elm Street, a short street that began at Hanover Street, met Washington Street. 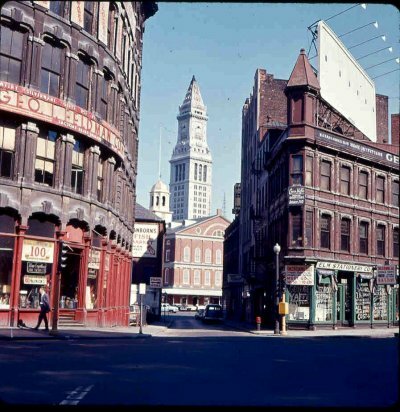 Court Street, Cornhill, and Brattle Street could all take you from Scollay Square down to Washington Street and Adams Square. 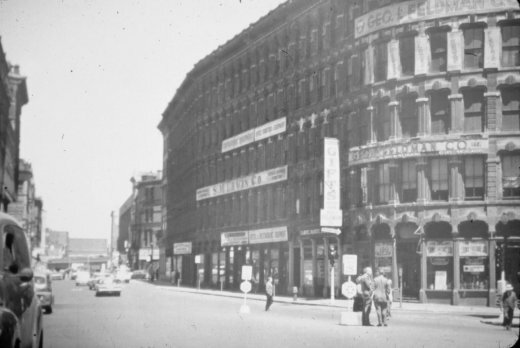 The Leopold and Morse building, in the center of this aerial, is one of the few remaining in Adams Square when this photo was taken, probably in early 1962. 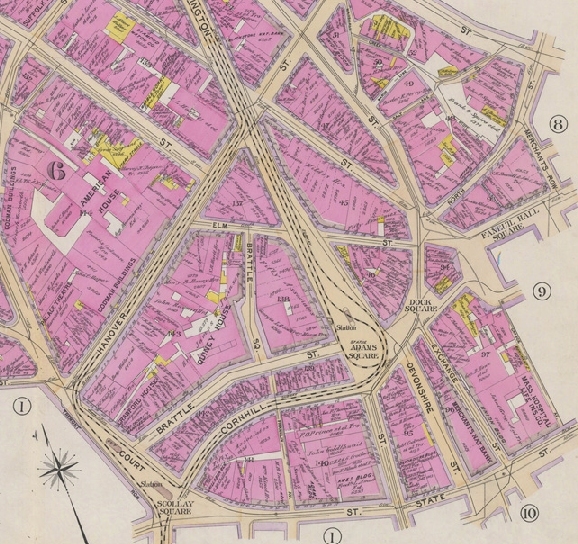 All of Scollay Square has been razed by this point, although Brattle Street still cuts from Cambridge Street (on our left) down to Washington Street. 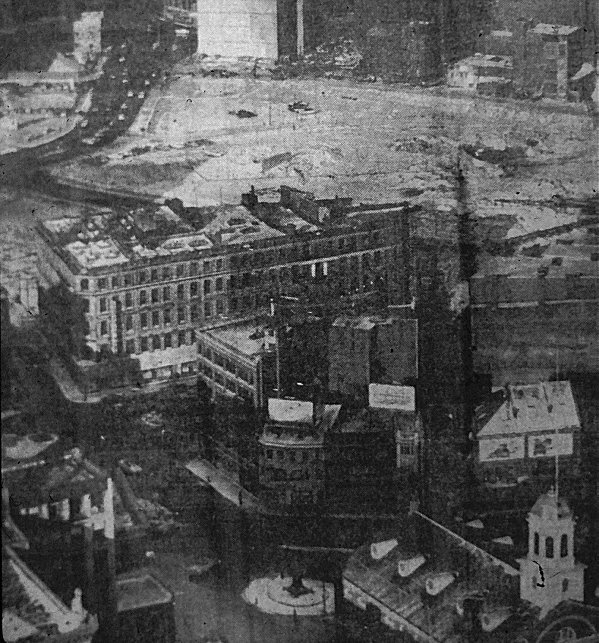 Dock Square and Faneuil Hall are visible at the bottom of this terrific newspaper photograph. Looking in the same direction as the picture above, probably a year or so later. Running along the lower portion of this picture is the box that will carry the realigned subway (what we today call the Green Line) from Government Center to Haymarket. No need for an Adams Square stop anymore since Adams Square - in fact, all of Washington Street north of State Street - has been wiped from the map. In the distance, we can see Charles River Park, which replaced the West End and, in the middle of the photo, the foundation for the new John F. Kennedy Federal Building, which today anchors the north side of City Hall Plaza. These are new. 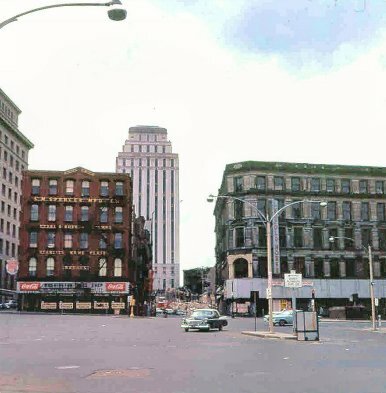 Since we have spent so much time watching the evolution of Adams Square above ground, I thought I'd share these pictures from a post on the "MBTA (MTA) Through theYears" Facebook page. 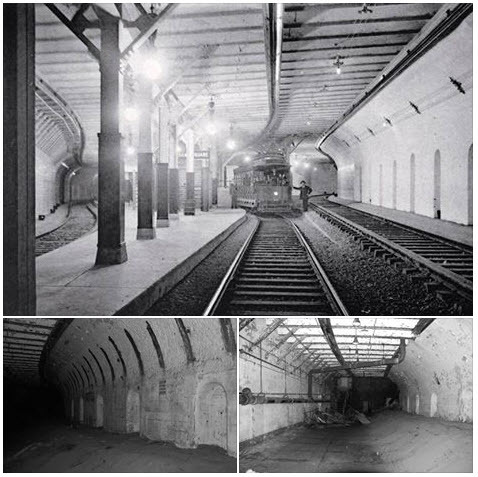 With thanks to poster Tarn Stephanos, who wrote: "Then and now- Adams Sq station in use, and the sealed off tunnel after the construction of Boston City Hall. 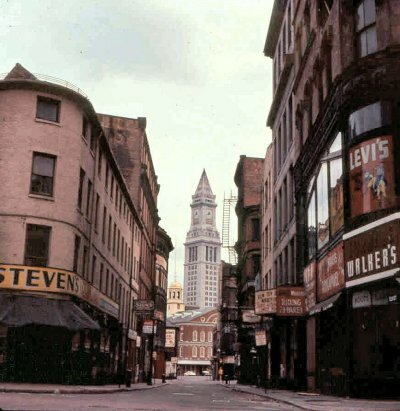 A section of tunnel along Cornhill Street from Scollay Square to Adams Square still remains."